You’re watching the news when you see the meteorologist point out a small storm in the Atlantic Ocean. In the coming days, that swirling energy cell becomes a tropical storm, then a hurricane. Initially it looks like it won’t hit your area, but with each passing day, the storm’s path changes. Suddenly, your town is on the edge of the predicted path. Its strength grows to a category 3, its path changes again, and now a major storm is barreling straight for you. The chances of a hurricane or other natural disaster wreaking havoc on your home or business can vary depending on where you are. In April 2018, Colorado State University forecasted a 63% chance that a major hurricane– a category 3 or stronger storm– would hit the east coast of the United States. They predicted that of 14 named storms this hurricane season, three would be major. For residents in the Carolinas watching the news reports, the possibility of getting hit by a hurricane became a very harsh reality with Florence. When you are faced with a potentially devastating disaster, you rush to the store to buy food, water, and other supplies. You fill your car with gas. You board up your windows and prepare to evacuate. But what about your business? Those windows may be boarded up, too… but what if a power surge or flood ruins your servers? What if your stock and supplies are ruined, or your building smells like mildew? What is your disaster recovery plan? Insurance may cover your costs, but is your business going to be able to pull through an extended period of downtime? If you collect data of any kind for your business, performing backups is a must. Some businesses think keeping a backup server in another room is sufficient. Others spend considerable amounts of money on an off-site secondary data center they might never have to use. Even more businesses flirt with disaster every day and don’t have any kind of backup plan in place. But when your business experiences an outage for hours, days, or weeks at a time, will it be able to survive? Business owners are hesitant to implement a disaster recovery plan because they can be cost prohibitive when using a secondary data center. After all, this requires a duplicate of your systems and hardware, and staff to keep it running every day of the year. 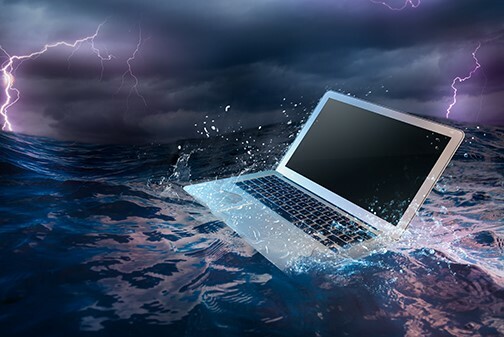 However, buying your own server and keeping your backups in your office isn’t a great approach, either; if your main systems get flooded, so do those servers… and how diligent will you really be in keeping those backups up to date? There’s an easier and cost-effective solution to having a safe, stable, and robust disaster recovery plan: real time, up-to-the-minute, system replication with Azure Cloud. Azure will keep up to date with every order, credit card transaction, quote and more that you were working on. Having a full replica of your data center in Azure will only cost you the storage your solution uses, and the rest is “shut off.” You only pay for what you use. In addition, even if your systems are all on premises currently, if you decide in the future to move them to Azure, you’re already well on your way. AKA Enterprise solutions can help you determine your license applicability for hybrid benefits in Azure so that when you decide to run in the Cloud, your costs are minimized. Sleep better at night knowing that your affordable and reliable disaster recovery plan is in the Cloud. Learn more by downloading our disaster recovery guide, then contact the experts at AKA Enterprise solutions to discuss the best plan for your organization.